Dim sum is one of our favourite weekend treats. This weekend I decided we needed to have some dim sum tea time so I made a few steamed items that we like to order. It was definitely our big meal for the day but totally worth it. Just one or two of each item and I felt full and indulged. I even brewed up a nice pot of rose petal green tea to go with it. Yum! It may take some time, but really a nice rewarding weekend treat in the end. Add the flour and mix until the dough holds together. This can be done in a bread machine. Place on a lightly floured surface and knead until smooth and elastic. Allow to rise in a bowl (or breadmachine) until it has doubled usually an hour. To prepare the filling. Combine the pork, garlic, ginger, 2 tsp of splenda, and 2 tbl of soy sauce in a bowl. In another bowl combine 2 tsp of splenda, flour, 2 tbl soy sauce, hoisin sauce, wine and water. Spray a pan and heat on high. Add the pork and stirfry until browned. Add the onion and stirfry until soft. Stir in the sauce mix and cook, stirring, until the sauce boils and thickens. Allow to cool. You can either roll each piece into a 4 1/2 inch round or flatten them with your hand. I flattened with my hands, it was faster. Place 2 tbl of filling into each round. Pull the edges of the dough up around the filling and twist to seal. Place each bun sealed side down on a 3 inch square of foil or wax paper. Cover and let rise until puffy and light, approximately 30 minutes. This is what they look like right before they are steamed. The picture for the recipe above is how they look after. 13. 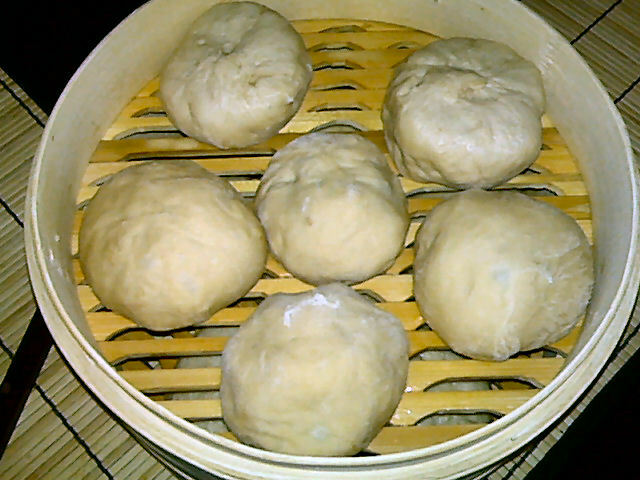 Place them gently into a steamer, I use a bamboo one. Set the steamer over boiling water. Cover and steam for 12-15 minutes. The tops should appear glazed and smooth. You can serve these warm or cool. If you have any leftover you can wrap them airtight and freeze them for up to 4 weeks. 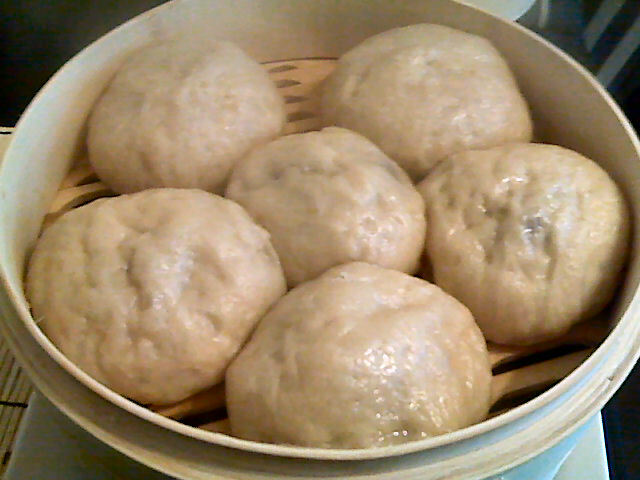 To reheat them just put the frozen buns in the bamboo steamer for 10 minutes. Makes 12 buns, each bun is 209 calories, 2.7 grams of fat and 1.2 grams of fiber. As you can see from the picture they are huge!! Even my uber hungry husband was only able to eat two before he was full. We love to serve these buns with a nice hot garlic chili sauce. No idea what its called, I just see the rooster and pick it up. It is hot stuff! So don’t put a ton on unless you are a seasoned dim sum yummer. This was only a part of our dim sum feast. I’ll be sure to put up the other little tasty delights later. These are the closest I have gotten to tasting like the restaurant so far. The filling wasn’t bright red like theirs is. I’m thinking they either use food colouring or maybe red bean paste? These taste good and sweet enough for me though! 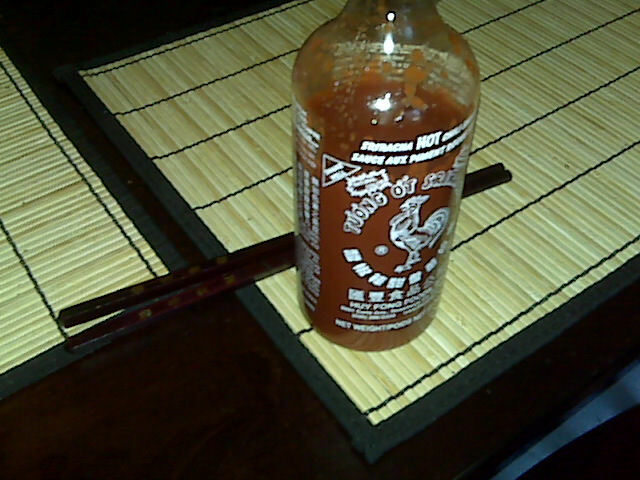 With a bit of chili sauce and rosepetal green tea they are just divine!! This entry was posted in Craving Buster, Lunch and tagged Pork. Bookmark the permalink.